Now days, more than ever before, people are travelling all over the world as travel is more affordable than it has ever been. It is wonderful to bring back mementos of our holidays, in New Zealand or overseas, as a reminder of exciting, happy times and experiences. What better way than to bring back a picture or poster or even a postcard? They are light to pack and travel home with(weighing next to nothing) and can be framed when home. On a recent trip to Europe I spent a wonderful week in Florence. 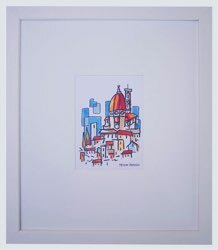 I bought a little card (above) that I liked and when I returned home I framed it (see picture of Florence). Because the picture was small I decided to frame it with a larger white matboard border and this gave me a decent sized picture to hang on the wall. A small picture with a large matboard border can be very attractive and show the small picture to its best advantage. 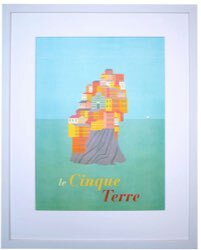 During an exciting day spent at Cinque Terra I purchased a poster to remind me of that day (see picture of Cinque Terra at top). From a trip to Africa. One customer had spent 6 months travelling in Europe and came home with about 10 pictures she wanted framed. Some were original art works and some were posters or prints. She decided to frame them all with either back or white frames so that they would fit in anywhere in her home and the framing didn’t break the bank! 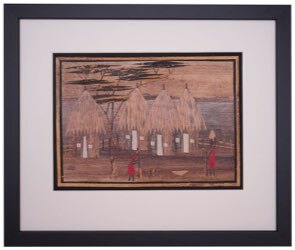 Another customer chose to have tapa cloth from Fiji framed. This was floated on a conservation matboard with an attractive wooden frame. At other times people choose to have a collection of favourite photos from a holiday framed. This can be done by using a multi-opening matbaord or getting a collage of photos printed and then framing this. Please feel free to contact Cathy for a quote to frame your holiday memories.